What is the poverty status of various eligible people (example: African Americans, seniors, Hispanics, and those with less than a high school education) in our service area? Which vulnerable populations make up the largest share of our area’s total poverty population? How do these populations overlap? Should the overlap impact how we serve these populations? Select a geographic type from the drop down (in this example geographic type is county, state is Illinois, and county is Cook County). Determine each demographics’ share of the poverty population in a separate table. Example: 65+ in 2010: 68,440/856,360 = 8%. 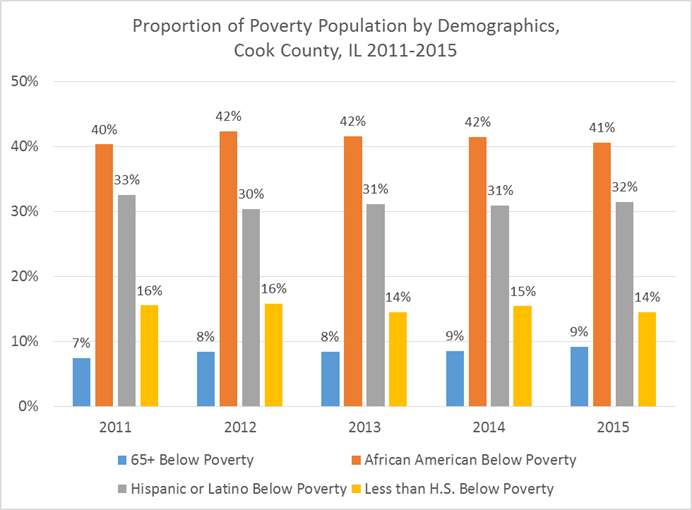 In 2010, 8% of the people below poverty in Cook County, IL were 65+. Create a clustered column chart to show your results. Based on your results, you may want to dig deeper to understand more about how these populations overlap. Go back to the ACS Advanced Search and download the most recent 1-year estimates of the B17020B and B17020I tables to see how race and ethnicity overlap with age. Note that these tables show age categories for seniors as 60-74, 75-84, and 85+, which is different from that S1701 table that provided data for those 65+. For this example, create tables or charts in Excel that show the percentage of African Americans and Hispanics in poverty who are seniors. In this example, the data show that 14% of the African American poverty population are 60+ and 7% of the Hispanic or Latino poverty population are 60+.